You're not alone if you're looking to replace your aging laptop with Toshiba's Satellite Radius 15, the world's first hybrid convertible with a 4K display. Hybrid notebooks are the fastest growing segment of the mobile PC market this year, according to research from Gartner, with shipments expected to increase 70% compared with last year. PC manufacturers are expected to ship 21.5 million hybrid units this year, accounting for 12% of mobile PC sales and up to 26% by 2019. "Of the 21.5 million hybrid devices shipped in 2015, 8 million will be ultramobile tablets (two-in-one tablets) and 13.5 million hybrid ultramobiles (two-in-one detachable and convertible ultramobiles). This will make hybrid ultramobiles the fastest-growing segment of the mobile PC market with 77 percent year-on-year growth," said Tracy Tsai, research director at Gartner. Gartner's analysis breaks up hybrids into two types of devices. The first are tablet-first devices. These mainly include the Microsoft Surface and Surface Pro series, which are sold primarily as a tablet and users will have to buy an optional keyboard cover to convert the slates into a notebook form factor. Microsoft dominated this segment, accounting for 36% of the market in 2014. 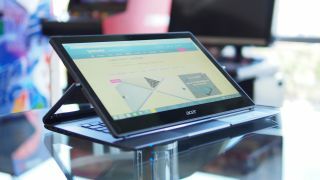 The second category is the hybrid ultramobile, which ships as a laptop that comes with a 360-degree hinge or a removable keyboard dock. Having been the first to release a hybrid ultramobile, Asus leads this category with 41% of the market, shipping 3.1 million units. This led to a 263% year-over-year increase. Lenovo ranked second with 1.9 million units, representing a 331% year-over-year increase. Lenovo's hybrid models include the ThinkPad Helix, Yoga 3 Pro and detachable ThinkPad 10. Consumers are among the first to realize the benefits of hybrid devices as IT departments have resisted deploying hybrids. Because many businesses are still on Windows 7 using legacy applications that are not designed for touch, the benefits of hybrids could not be immediately realized. "However, this will change when businesses start to migrate to Windows 10," said Tsai. "Windows 10 on hybrid ultramobiles will offer a better user experience with touch and voice as well as universal Windows apps – apps written just once that receive device-specific user experience tweaks to allow them to run on different Windows devices." Extended support for Windows 7 will end by 2020, and at that time hybrids may gain more widespread adoption in the enterprise. For enterprise road warriors, hybrids could reduce the weight of a gear bag as business executives no longer need to travel with both a laptop and a tablet. It may also help reduce device and data management costs as users no longer need two separate devices. Windows 10, which will debut July 29 for consumers, will bring better support for hybrids. Through a feature called Continuum, the operating system will automatically optimize the user experience if the device is in tablet or laptop mode. PC manufacturers are finding new ways to entice buyers to the hybrid market. HP brought a unibody MacBook-like design approach to its Spectre x360, while Acer brought a rotating screen to the Aspire R13.